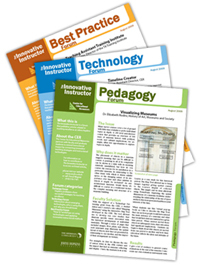 The Innovative Instructor publication series is a forum for articles on teaching excellence at Johns Hopkins University. Written by Hopkins faculty or campus instructional technology experts, the goal is to increase communication about effective teaching solutions and how to achieve them. Through these articles, instructors can share successful teaching strategies, learn what colleagues are doing, and discover new technologies and skills for the classroom or professional development. Pedagogy Forum: Hopkins professors share successful strategies for teaching excellence. Technology Forum: Information about emerging technologies, who is using them and why you should know. Best Practice Forum: “How To” workshops on using technologies and applying innovative instructional methods. You can pick up print copies of these articles at four locations: in the CER (MSE Library-Q Level-Garrett Room), in the hallway outside the CER, in the MSE Library at the M Level Circulation Desk, and in the café area of the Brody Learning Commons. To learn more about this series or to write an article, contact cerweb@jhu.edu or call Cheryl Wagner at 410-516-7181.